Israel Folau is set to be sacked following his social media posts on Wednesday night, leaving the Wallabies’ preparations ahead of September’s World Cup in chaos. A year after telling gay people that they were destined for hell on Instagram, the 30‑year‑old doubled down on his hateful, harmful rhetoric by sharing a meme that informed people that hell awaits “drunks, homosexuals, adulterers, liars, fornicators, thieves, atheists and idolaters” on the social media platform. And after Rugby Australia failed to make direct contact with Folau, he left them with no choice but to sack their superstar fullback. 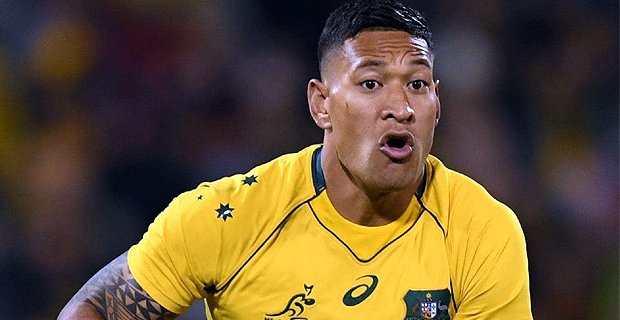 In a joint statement by Rugby Australia boss Raelene Castle and NSW Rugby Union’s Andrew Hore, the duo said that Folau’s actions didn’t represent the values of rugby and therefore had left them no choice but to terminate his four‑year‑deal. In the Super Rugby competition tonight, the Crusaders will meet the Highlanders at 7.35pm while the Rebels play the Stormers at 9.45pm. The Blues will take on the Chiefs at 7.35pm tomorrow while the Brumbies will face the Lions at 9.35pm.